In Bhutan you don't have to be special to visit the Royal Palace, meet your King, and converse with Him. His Majesty makes it his personal interest to invite different groups of people to his palace and talk heart to heart with them over tea, which often he prepares himself. On the eve of royal wedding I am proud to share about my visit to the palace and meeting His Majesty and Ashi Jetsun Pema. His Majesty wished to sit down with people from different media groups and thus there were people from newspapers, radio, TV, film industry, Media Foundation and me- well I was to represent the bloggers. 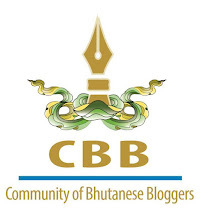 Blogging is picking up in Bhutan and now it is claiming its space alongside the mainstream media in the country. During the conversation His Majesty shared with us about how he wants his wedding to be- humble and truly Bhutanese. He wants no chairs, no plates, no cold drinks, no beer, no wines, no international cuisines. He beamed as he described the display of local delicacies from 20 dzongkhags and palangs of local beverages. From the way he described his wedding plan it sounded to me like a wedding of an ordinary Bhutanese, and it made me so proud to be a Bhutanese. His Majesty talked to us on various subjects ranging from his choice of music to books he read, from ancient Indian kings to first recorded Bhutanese song, from Ashi and him fighting for TV remote and laptop (they only have one TV and one laptop) to discovery of Third King's storeroom in Tashichhoedzong. When he shared the letter third king wrote to his Majesty the fourth king, who was then studying in London, I couldn't hold my tears. His majesty and Ashi talked to each of us by calling our names and asking about things we do. Ashi Jetsun showed interest in my blog and asked for the blog address. She said, " I should read your blog. ", which sounded to me like " The Oscar for the best Best Blog goes to PaSsu!!" Throughout the audience I couldn't help watching his majesty's expression of love to ashi through his words, his smile, his touch and playfulness. Nothing in the world seemed to me so perfect than the choice our king made, and nothing in the world felt so powerful than the love I saw between the royal couple. His Majesty fondly told us that ashi takes good care of him despite being ten years younger to him and I thought that's the best service a queen could render to her country. Tonight I pray to all gods in heaven with all my heart to bless our king and queen all the happiness in the world. And May the divine Royal love reflect in lives of every Bhutanese couple for all the times to come. P:S: My visit to Lingkana Palace was about a month ago, I am sharing it on the eve of Royal Wedding. WOW! Sir, you are really very lucky to have met and talked to The Royals. Looking forward to read your up-coming-post. Oh, the picture is beautiful. Thank you all for being kind with your words, actually i didn't do anything special to deserve it, I just got lucky. Dechen Ugyen, thanks for loving my writings. I love reading your comments. Thanks Lamzang, that was a special day for me because it was my first. DechenUgyen, you are putting me in big trouble, I can't handle such huge expectation... But I will always try. I will write a little better and little wiser with each new day. Thank you so much for your praise. Thank for opening passudiary before Facebook. Ok. I am waiting for your next post. Have a nice day. Wow.! really good articles sir, when i was going through it, it's really touching and once i felt like i was there with you all during that special moment haa...hha but i realized that i have to do lots to have such huge privilege...but any way i enjoyed reading your articles. i am really becoming your articles fan now sir,..